Based in Ottawa, Canada, The Rebel Wheel first started in the early Nineties as a midi-based studio project by guitarist David Campbell. After going through numerous incarnations over the years, the band released their first, self-titled official CD in 2003, followed by Diagramma in 2008. 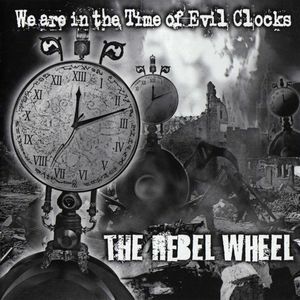 Their third album, We Are in the Time of Evil Clocks, was released in the late spring of 2010 on 10T Records, like the band’s previous effort. At the time of writing, vocalist/keyboardist/saxophonist Angie MacIvor is on leave following the birth of her first child, but is planning to rejoin the band in 2012, while bassist Claude Prince has been replaced by Andrew Burns. In early September The Rebel Wheel will be performing at the 2011 edition of ProgDay, with former Camel and Nathan Mahl keyboardist Guy LeBlanc (who also appears on one track of this album) as a special guest. As even a cursory listen to We Are in the Time of Evil Clocks will reveal, The Rebel Wheel delve deep into the legacy of controlled chaos and mesmerizing, romantic gloom bestowed to the prog world by the likes of King Crimson and Van Der Graaf Generator. The album is certainly dark-hued, as its title and stylishly macabre artwork suggest, with most of the songs bearing esoteric titles, and a 30-minute, seven-part epic dedicated to witchcraft. However, unlike in the case of some “retro” outfits clearly inspired by Coven or Black Widow, there is no occult subtext whatsoever to be found on the album, which instead revolves around a gloomily dystopian view of the future, reminiscent in some ways of Sinfield-era King Crimson. Guitarist/keyboardist David Campbell and keyboardist/saxophonist Angie McIvor share vocal duties, assisted by a strong rhythm section – Claude Prince’s extremely impressive bass work being, in my view, the cornerstone of the album. They also manage to shift almost effortlessly between aggressive passages and more subdued ones, with dissonant patterns occasionally lurking in the sax and guitar lines, creating a sense of driving intensity. Even though King Crimson are undoubtedly the main term of comparison, the band succeed in presenting their own individual twist on some of the most influential, cutting-edge music produced in the Seventies without sounding as overtly derivative as other celebrated outfits. In keeping with its title, We Are in the Time of Evil Clocks is bookended by the eerie, ominous sound of ticking clocks and assorted machinery. Its structure distinctly resembles Shadow Circus’ Whispers and Screams, released in the second half of 2009, which also features a 30-minute suite followed by separate songs. In this case, however, the epic is located in the second half of the disc rather than the first, which comprises five songs, most of them in a similar vein to the epic. The only exception is the folksy, low-key Settling of Bones, where Angie McIvor’s distinctive voice – warm and melodic, yet with a slightly plaintive quality – is enhanced by gently plucked guitar and bass strings. The title-track, on the other hand, opens the proceedings with a forceful, King Crimson-meets-VDGG punch that mellows out in the song’s second half. Soothing and menacing in turns, Klak sports a huge bass sound and choppy rhythm in the best tradition of Fripp’s crew; while Wordplay shifts from a gentle, acoustic mood to a tense, bristling pace redolent of Red-era King Crimson. Like Shadow Circus’ Project Blue, The Discovery of Witchcraft is split into seven sections that work equally well as stand-alone tracks and as parts of a whole. The three short songs titled Hags (mostly interpreted by McIvor, and sharing a recurring theme) connect the four main episodes of the suite, their mellow yet subtly haunting mood reminiscent of early King Crimson, or even The Mars Volta’s slower numbers such as The Widow. The remaining four parts, however, evoke the titular witchcraft quite effectively. Convent is a stunning, bass-led piece with suitably sinister Hammond organ and eerie whispered vocals that may bring to mind a cello-less Anekdoten, and the strident, dissonant MadNight is very much in the mould of King Crimson circa “Starless and Bible Black”; while the swingy piano and sax in Invitation to the Dance remind the listener of the band’s jazz-rock roots, and Cavort blends spacey electronics with deep, powerful bass lines in an intense, yet disciplined build-up. We Are in the Time of Evil Clocks is a striking effort, though, in my view, its impact would have been even stronger if it had been trimmed down a bit. Lovers of the angular, eclectic sound of King Crimson, VDGG or Anekdoten will definitely find the album a very rewarding listen, especially on account of the admirable balance between melody and intensity. It also seems that the band has finally reached a measure of stability, and the overall feel of maturity projected by the album certainly bodes well for The Rebel Wheel’s future. I will be definitely be looking forward to their ProgDay performance next month. Great! I did like the previous album “Diagramma 2007” too, Let´s check them playing live now !!! I like this band’s vibe and sound; while somber, it’s cool, elegant and appealing. This album is an impressive one; indeed ,angular and eclectic in its flavours, it’s a delicious feast; and a feast it is, as it is a tad long, but not something that impact the enjoyment I derive from it. Mr. Campbell is a talented composer and musician as are his bandmates. I wish I had an ounce of his talent.